There are weapons that are simply thoughts, attitudes, prejudices, to be found only in the minds of men. For the record, prejudices can kill and suspicion can destroy; and a thoughtless, frightened search for a scapegoat has a fallout all of its own for the children, and the children yet unborn. And the pity of it is, that these things cannot be confined to the Twilight Zone. 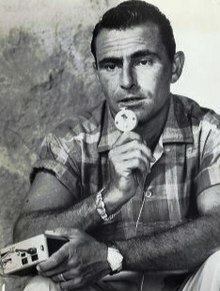 Rodman Edward Serling (25 December 1924 – 28 June 1975) was an American writer, known primarily as Rod Serling; most famous for his science fiction TV series The Twilight Zone. I happen to think that the singular evil of our time is prejudice. It is from this evil that all other evils grow and multiply. In almost everything I've written there is a thread of this: a man's seemingly palpable need to dislike someone other than himself. First introduction to The Twilight Zone television series; first episode (2 October 1959). The tools of conquest do not necessarily come with bombs, and explosions, and fallout. There are weapons that are simply thoughts, attitudes, prejudices, to be found only in the minds of men. For the record, prejudices can kill and suspicion can destroy; and a thoughtless, frightened search for a scapegoat has a fallout all of its own for the children, and the children yet unborn. And the pity of it is, that these things cannot be confined to the Twilight Zone. From The Twilight Zone episode The Monsters Are Due On Maple Street (March 6, 1960). There is an answer to the doctor's question. All the Dachaus must remain standing. The Dachaus, the Belsens, the Buchenwald, the Auschwitzes – all of them. They must remain standing because they are a monument to a moment in time when some men decided to turn the Earth into a graveyard. Into it they shoveled all of their reason, their logic, their knowledge, but worst of all, their conscience. And the moment we forget this, the moment we cease to be haunted by its remembrance, then we become the gravediggers. Something to dwell on and to remember, not only in the Twilight Zone but wherever men walk God's Earth. The Twilight Zone, "Death's-Head Revisited" (1961). It is said that science fiction and fantasy are two different things. Science fiction is the improbable made possible, and fantasy is the impossible made probable. The Twilight Zone, "The Fugitive" (1962). How can you put out a meaningful drama when every fifteen minutes proceedings are interrupted by twelve dancing rabbits with toilet paper? No dramatic art form should be dictated and controlled by men whose training and instincts are cut of an entirely different cloth. I happen to think that the singular evil of our time is prejudice. It is from this evil that all other evils grow and multiply. In almost everything I've written there is a thread of this: man's seemingly palpable need to dislike someone other than himself. Ellen Cameron May, "Serling in Creative Mainstream" (profile/interview), Los Angeles Times (June 25, 1967), page C22-23. If survival calls for the bearing of arms, bear them you must. But the most important part of the challenge is for you to find another means that does not come with the killing of your fellow man. I ask for your indulgence when I march out quotations. This is the double syndrome of men who write for a living and men who are over forty. The young smoke pot — we inhale from our Bartlett's. ...a medium best suited to illumine and dramatize the issues of the times has its product pressed into a mold, painted lily-white, and has its dramatic teeth yanked out one by one. "About Writing for Television", his foreword to a collection of teleplays ("Patterns"). How can you put out a meaningful drama when every fifteen minutes proceedings are interrupted by twelve dancing rabbits with toilet paper? No dramatic art form should be dictated and controlled by men whose training and instincts are cut of an entirely different cloth. The fact remains that these gentlemen sell consumer goods, not an art form. Rod Serling: Submitted for Your Approval (October 1997), American Masters (PBS: Thirteen/WNET). Hollywood's a great place to live... if you're a grapefruit. From a letter to his wife, as quoted in Rod Serling: Submitted for Your Approval (October 1997), American Masters (PBS: Thirteen/WNET). If you need drugs to be a good writer, you're not a good writer. I was a Christmas present that was delivered unwrapped. I got the idea for the pilot while walking through an empty lot of a movie studio. There were all the evidences of a community but with no people. I felt at the time a kind of encroaching loneliness, and desolation; a feeling of how nightmarish it would be to wind up in a city with no inhabitants. I was dealing with a political story where much of the action took place on the floor of the U.S. Senate, and one of the edicts that came down from the Mt. Sinai of advertisers row was that at no time in a political drama must a speech or a character be equated with an existing political party or current political problems. So several million viewers were treated to an incredible display of senators shouting, gesticulating and talking in hieroglyphics, saying not a single thing germaine to the current political scene. Rod Serling on Arena, American Masters. Someplace between apathy and anarchy is the stance of the thinking human being; he does embrace a cause, he does take a position, and can’t allow it to become business as usual. Humanity is our business. Once again there appears to be a considerable difference of opinion. I wanted a series with distinction, I have no interest in a series which is purely and uniquely suspenseful but makes no comment about anything. But all they seem to want is maniacs in a cemetery. When I complain they pat me on the head, condescend, and hope I go away. 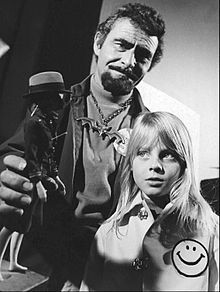 When I was on the Twilight Zone I took the bows, but I also took the brickbats, because when it was bad it was usually my fault, but when it's bad on the Night Gallery, I had nothing to do with it, yet my face is on it all the time. For the first time in television a writer will have the opportunity to let his imagination take him where ever he wants to. The sky is no longer the limit. The first sale, that's the one that comes with magic. As I get older the urge to write gets less and less; I've pretty much spewed out everything I have to say, none of which has been particularly monumental; nothing that will stand the test of time. Good writing like wine has to age well, and my stuff has been momentarily adequate. Every writer is a frustrated actor who recites his lines in the hidden auditorium of his skull. In his grave, we praise him for his decency - but when he walked amongst us, we responded with no decency of our own. When he suggested that all men should have a place in the sun - we put a special sanctity on the right of ownership and the privilege of prejudice by maintaining that to deny homes to Negroes was a democratic right. Now we acknowledge his compassion - but we exercised no compassion of our own. When he asked us to understand that men take to the streets out of anguish and hopelessness and a vision of that dream dying, we bought guns and speculated about roving agitators and subversive conspiracies and demanded law and order. We felt anger at the effects, but did little to acknowledge the causes. We extol all the virtues of the man - but we chose not to call them virtues before his death. And now, belatedly, we talk of this man's worth - but the judgement comes late in the day as part of a eulogy when it should have been made a matter of record while he existed as a living force. If we are to lend credence to our mourning, there are acknowledgements that must be made now, albeit belatedly. We must act on the altogether proper assumption that Martin Luther King asked for nothing but that which was his due... He asked only for equality, and it is that which we denied him. Letter to The Los Angeles Times in response to the assassination of Martin Luther King, Jr.; April 8, 1968. I'm dedicating my little story to you; doubtless you will be among the very few who will ever read it. It seems war stories aren't very well received at this point. I'm told they're out-dated, untimely and as might be expected - make some unpleasant reading. And, as you have no doubt already perceived, human beings don't like to remember unpleasant things. They gird themselves with the armor of wishful thinking, protect themselves with a shield of impenetrable optimism, and, with a few exceptions, seem to accomplish their "forgetting" quite admirably. But you, my children, I don't want you to be among those who choose to forget. I want you to read my stories and a lot of others like them. I want you to fill your heads with Remarque and Tolstoy and Ernie Pyle. I want you to know what shrapnel, and "88's" and mortar shells and mustard gas mean. I want you to feel, no matter how vicariously, a semblance of the feeling of a torn limb, a burnt patch of flesh, the crippling, numbing sensation of fear, the hopeless emptiness of fatigue. All these things are complimentary to the province of war and they should be taught and demonstrated in classrooms along with the more heroic aspects of uniforms, and flags, and honor and patriotism. I have no idea what your generation will be like. In mine we were to enjoy "Peace in our time". A very well meaning gentleman waved his umbrella and shouted those very words...less than a year before the whole world went to war. But this gentleman was suffering the worldly disease of insufferable optimism. He and his fellow humans kept polishing the rose colored glasses when actually they should have taken them off. They were sacrificing reason and reality for a brief and temporal peace of mind, the same peace of mind that many of my contemporaries derive by steadfastly refraining from remembering the war that came before. Excerpt from a dedication to an unpublished short story, "First Squad, First Platoon"; from Serling to his as yet unborn children. It's simply a national acknowledgement that in any kind of priority, the needs of human beings must come first. Poverty is here and now. Hunger is here and now. Racial tension is here and now. Pollution is here and now. These are the things that scream for a response. And if we don't listen to that scream - and if we don't respond to it - we may well wind up sitting amidst our own rubble, looking for the truck that hit us - or the bomb that pulverized us. Get the license number of whatever it was that destroyed the dream. And I think we will find that the vehicle was registered in our own name. Commencement Address at the University of Southern California (March 17, 1970). I really can’t claim to being a science-fiction man either. Fantasy was really more my bag. And I’m very much a Johnny-Come-Lately into that. The guys – the really key men – like Asimov, Clarke, Bradbury – they all preceded me by years and years and have a body of literature to show for it. I have nothing but a television show. My only claim is that I put science-fiction and fantasy into a mass media more than any other person. "Rod Serling Recalls Planet of the Apes" . I didn't know him that well, not in social circles. He was a friendly sort and, as a writer, very supportive of his writers on the show. But he always shot my scripts word for word. He seemed to be driven, almost harassed by life. He seemed to reach a plateau in his career, and after a time it all came crashing down. That kind of fame is very difficult to adjust to. Luckily, I've never had that kind of pain or pleasure. For Rod, the Twilight Zone was a success, and yet he was sort of victimized by it. His best work was the Playhouse 90 stuff, the social commentary. The Twilight Zone made him a TV personality, and that kind of fame took its toll. I knew Rod and socialized with him also. And, of course, I worked with him, too; we had previously collaborated on some westerns and detective stories. He was really a sweetheart. He was a writer himself, which was extremely unusual back then, for someone who started a series to already be a successful writer. He had had lots of experience with production people, so he understood that he needed to surround himself with the best writers he could get, and then let them do their thing. There wasn’t a line in any of the Twilight Zones that I wrote that wasn’t mine. No one could know Serling, or view or read his work, without recognizing his deep affection for humanity, his sympathetically enthusiastic curiosity about us, and his determination to enlarge our horizons by giving us a better understanding of ourselves. He dreamed of much for us, and demanded much of himself, perhaps more than was possible for either in this time and place. But it is that quality of dreams and demands that makes the ones like Rod Serling rare ...and always irreplaceable. This page was last edited on 4 September 2018, at 18:17.